Vinegar is the timeless combination of acetic acid and water that has become a well-known liquid in practically every household. Many people subject its use to culinary purposes, but there are actually a surprisingly wide variety of medical, scientific, and domestic uses. Try hacking your daily routine with the clever uses of white vinegar listed below. Using white vinegar is a good way to avoid using harsh chemicals and it’s also economical and environmentally friendly. Here are 10 life hacks using vinegar. Make sure to scroll down to watch the video as well. Your trash bin most likely won’t smell like roses after a stint of collecting garbage. Sometimes the stench will permeate the bin and stink up your home even when there isn’t garbage in it. This problem can easily be solved with a piece of bread and vinegar. Soak the bread in vinegar and place it on top of a paper towel at the bottom of your trash can before bed. When you wake up and remove the bread it will have successfully eliminated the putrid stench. Feel free to try this anywhere in your home where a foul odor is lingering. You don’t need to bust out an ironing board every time you want clothes to look smooth and presentable. Vinegar can be used as an effective method of removing wrinkles from your clothing. In a spray bottle mix together 1 part vinegar to 3 parts water. Hang up the clothing and spritz it with the mixture and let the clothes hang and air dry. After waiting a few minutes you’ll find that the wrinkles are gone and you’re left with some spiffy looking fabric. When bathtub and sink drains clog up it can lead to some serious headaches. The blockage is stubborn and usually requires a visit to the store and investment in costly products. The answer to your problems could be as simple as a grade school science experiment with vinegar and baking soda. To unclog your drain with vinegar start by boiling a cup of water and pouring it down the blocked drain. Next pour in a half cup of baking soda and wait a few minutes. Mix together a cup of hot water with a cup of vinegar and add it to the drain then wait about ten minutes. To finish it off you should add a final cup of boiling water and your drain should be cleared of sludge and flowing like new. It seems a little ridiculous that so many cleaning products are available in stores when they can almost all be replaced with a little bit of vinegar. To make an effective all-purpose cleaner, start with an empty spray bottle and fill ⅓ of it with vinegar. Fill the rest of it with water and a squirt of dish soap (whichever scent you like the best) and give it a shake. This homemade cleaner works great on practically any surface and is a lot more cheap and safe than most cleaners found in stores. You can also find here how to make sanitizing natural household cleaner using essential oils. Tired of cats wandering around your home and garden like it’s their stomping ground? Or perhaps you’ve got a pet that scratches at your furniture and sheds its hair all over it. Since a pet’s sense of smell is so keen, spraying a little vinegar will keep the animals away from certain areas. If you’re worried about the vinegar affecting plant life or ruining furniture you can dilute the mixture with water. Placing a vinegar soaked rag in certain areas will also suffice. Pots and pans are vulnerable to some seriously stubborn food and burn stains. Try mixing a cup of vinegar with a cup of water in your dirty cookware. Use more if the pan is larger. Bring the mixture to a boil and let it sit a little while. After you’ve removed the pan from heat add a few tablespoons of baking soda and let it fizz out. Once you’ve rinsed and wiped the cookware down it should look like it came right off the store shelf. Sometimes when you peel a label, sticker, or tape from a surface it leaves behind a stubborn mark of residue. Leftover adhesive marks aren’t easily removed by a simple watery scrub. Luckily for you white vinegar can take care of it. Pour some vinegar into an empty spray bottle and cover the area affected by the adhesive. Let it soak for around 30 seconds before wiping it up with a cloth. The vinegar should act as a solvent to eliminate the marks with ease. A vase full of flowers makes for beautiful decor but they seem to die fairly quickly. There are many different home remedies to prolong flower life. Vinegar stands as one of the most effective ways to preserve your vase plants and make them give the drooped ones a little extra life. Instead of putting the flowers in just water, you’ll make a mixture of vinegar, water, and sugar for them to sit in. Combine two tablespoons of vinegar with a tablespoon of sugar in a vase and replace the flowers. The bouquet should stay healthier for a longer period of time. If the lenses of your prescription glasses or sunglasses keep dirtying on you, a little bit of white vinegar can help. Apply a small amount of the vinegar to the lenses and let it sit a few seconds. Rub it off gently with a soft cloth and the smudges and stains will disappear leaving your glasses clear and shiny. This is a common issue as most people use tap water, and after the water had been boiled and set, the minerals from the water collect on the kettle. You can overcome this issue by adding 1/2 cup white distilled vinegar to the water and letting it sit overnight. If more drastic action is needed, boil full-strength white distilled vinegar in the kettle a few minutes, let cool and rinse with plain water. Thank you I love your posts! did u try salt w.the vinegar? salt scrubs while vinegar cleans. i love this! i did almost the same to unclog my drain awhile back, but i put a bottle of lemon juice down the drain then baking soda on top waited about 5min then poured vinegar in….it bubbled it fizzed it was cool to watch and my drain was cleared! Where do you keep white vinegar and after you open the a gallon? You can keep it in your kitchen cabinet with your condiments, you do not have to keep it in the refrigerator.. 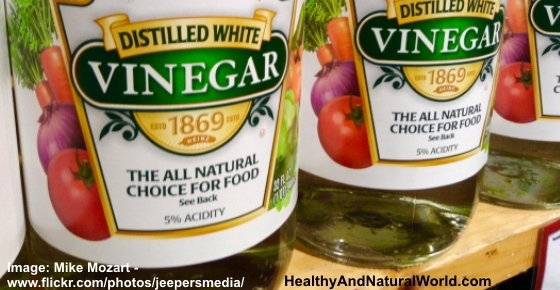 It should be on the label..
is all white vinegar the same? I buy my off brand at 99c store. Yes, you can buy the cheap one for household purposes.